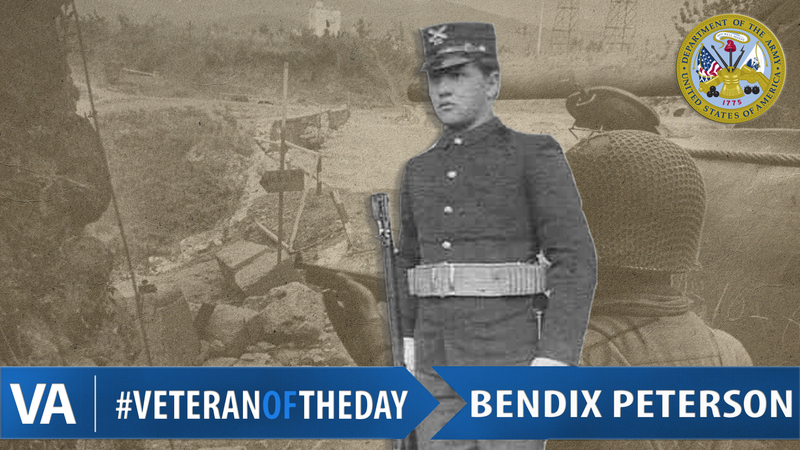 Today’s #VeteranOfTheDay is Army Veteran Bendix L. Peterson. Bendix served during World War I and World War II. Bendix was born on November 22nd, 1884 in Portland, Maine to Swedish and Danish immigrants. At the age of 18, he enlisted in the Army for the first time. He initially served in the National Guard at Fort Preble in Portland with an artillery company until his discharge in 1909. Bendix enlisted again in 1916 during World War I at the age of 31. He was assigned to Company D, 2nd ME Infantry Regiment of the Maine National Guard as a First Sergeant. In May of 1917 Bendix was selected to report to Plattsburg Barracks in New York for officer training. Upon completion of this training he was appointed as 2nd Lieutenant on August 15th, 1917. Bendix and his unit continued to drill and train until January of 1918 when they were activated and absorbed into the 302nd Infantry Regiment, part of the 76th Division of the American Expeditionary Force. He was promoted to 1st Lieutenant on January 17th and he and the rest of the 302nd went overseas, first to England then to France. When Bendix arrived in France, he served in combat from July 1st-November 11th of 1918, including the Meuse-Argonne Offensive. Bendix was then assigned to occupation duty from November 12th-December 27th of 1918. He was discharged from the Army for the second time on December 30th of 1918. Bendix enlisted again shortly thereafter and transferred Army Air Corp, rising to the rank of Major. He was separated from the service for the last time on November 29th of 1944 at the age of 60. Bendix passed away on November 7th of 1947 at the age of 62. About the author: Savannah Labbe is a senior at Gettysburg College studying history and religious studies. She is originally from Belgrade, Maine and is currently a writing intern at the U.S. Department of Veterans Affairs.